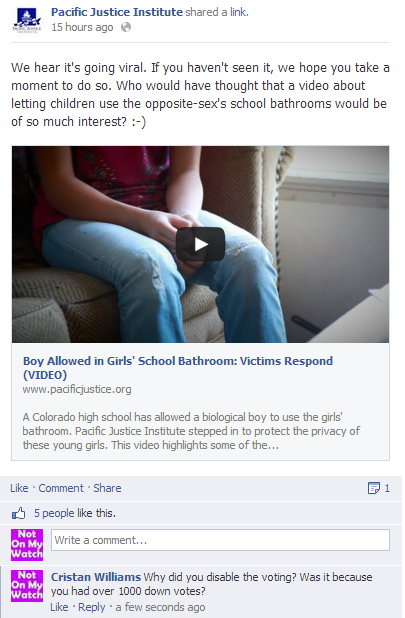 The Pacific Justice Institute (PJI) is the ex-gay organization that stirred up the right-wing word when it claimed that a trans kid (who I will refer to as Jane Doe, for reasons of safety) in Colorado was harassing cisgender girls in the restrooms. Right wing media outlets jumped at the story without fact checking PJI’s claims, prompting members of the right wing community to call for the death of the trans kid. As a result of PJI’s bullying Jane Doe was placed on a suicide watch. Even now, after PJI’s assertions were proven false, PJI still enjoys widespread unquestioning support from mainstream press outlets. For example, the AP unquestioningly dedicated 1/4 of its piece to PJI talking points, failing to note that PJI is an ex-gay organization or that PJI’s claims of harassment were proven false. The AP story supporting PJI’s narrative has been syndicated throughout the nation. 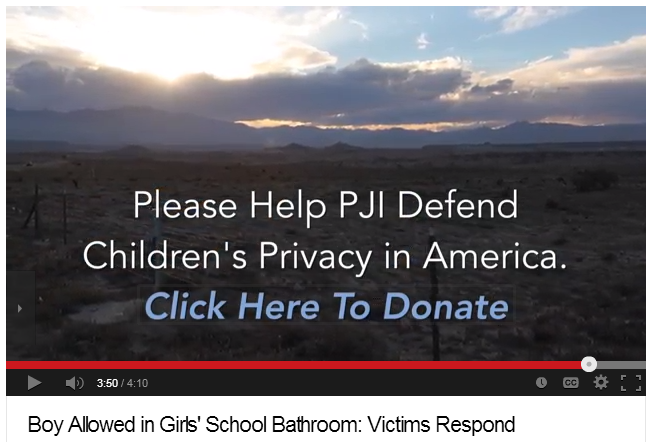 This week PJI released a professionally manufactured fundraising video. The video exploits a family’s terror of trans children for financial gain. 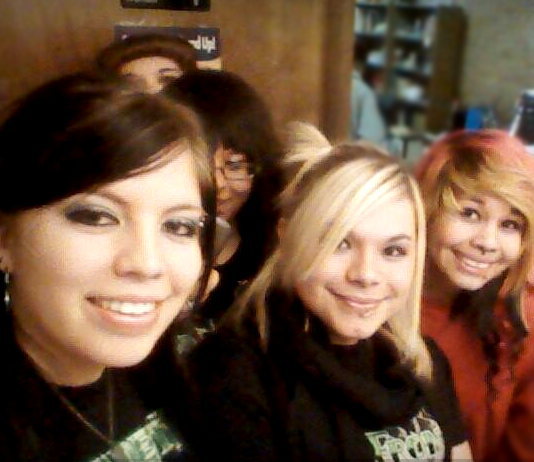 Before PJI: Jane Doe (front row, middle) with school friends. It’s clear that the family featured in PJI’s fundraiser video is truly terrified of trans kids. They clearly believe that Jane Doe poses a very real danger to cisgender kids. 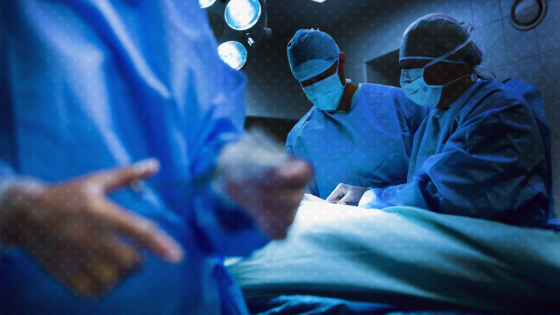 The mother is weeping in fright and the father is visibly upset over his perceived inability to protect his daughters from a harm analogous to electrocution and overdosing on drugs. At no point does PJI attempt to alleviate the terror of the parents. Instead, PJI’s president validates their fear, insisting that Jane Doe is a male who poses a risk because “he” uses the girl’s restroom. PJI uses background music and video editing effects to create a ominous atmosphere, clearly hoping to inspire viewers to feel a similar terror. 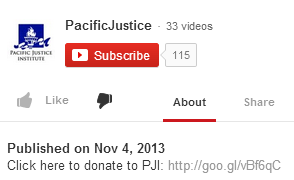 PJI ends their video, urging viewers to fight the scourge of trans children by giving PJI money. Missing from PJI’s video is any mention that when PJI claimed that police were conducting a criminal investigation into the trans kid’s behavior, PJI’s claim was debunked. Missing from PJI’s video is any mention of the fact the town of Florence, Colorado resents what PJI is doing to Jane Doe. Missing from PJI’s video is any mention of the fact PJI’s campaign against Jane Doe pushed her to brink of suicide or that the people featured in PJI’s fundraising video were under police surveillance for cyber bullying Jane Doe. Yeah, you might want to reread that previous sentence. But let me add one other thing on that, because in our messaging we haven’t spent a lot of time on the sincerity factor. Because, I don’t want to give the impression that if somebody isn’t sincere in this that it’s okay. And, I guess the way that I’ve been putting that to people is that sincerity doesn’t trump nakedness. 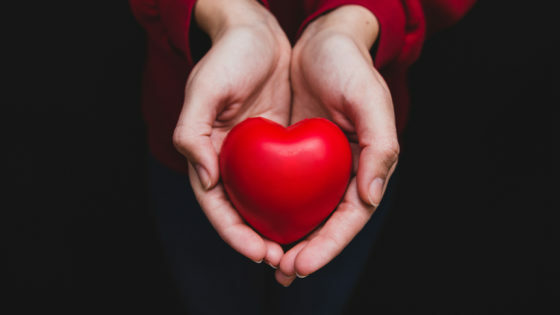 When a boy is standing naked in front of my daughter in the locker room, I’m not really concerned whether he is sincere in feeling like he’s a girl or not. Sincerity doesn’t trump nakedness. So, you are exactly right — the system can be gamed on this and I think it will, but it doesn’t matter. PJI’s board member was refreshingly honest about the fact that their messaging purposefully ignores whether or not the trans child is sincerely trans. Lefever is very clear that PJI’s strategy is to make people think about the suspected genitalia configuration of trans children in the hopes of encouraging people to view the children as a danger to cisgender people. In what way does PJI’s vial fundraising video deviate from this pre-selected narrative? The reality is that it doesn’t. PJI’s fundraising activities have held true to their predetermined messaging narrative, regardless of the facts. At every turn, PJI has claimed that unless society creates a social system of cis/trans segregation, they – not the trans children – are being bullied. At every step, PJI has encouraged people to view these trans kids as sexual predators. At least in right wing circles, PJI is refreshingly honest about the fact that they push this narrative because it pays off regardless of what happens to the trans children they target or the families they terrify with their anti-trans propaganda. Let’s pretend that all those views were from supporters and at the same time disable the video voting because we had over 1000 downvotes… Cus’ we’re flexible when it comes to honesty! Spot anti-trans signature gatherers in California? Report it at 866-377-0578!